Karen House : March 6, 2017, 10:53 p.m.
Thomas and Carol Gaddy in front of their home on Main Street. Because of a temporary injunction, they have been prevented from completing work on the soffit along the front of their sun room. Mr. and Mrs. Gaddy were not in court Thursday afternoon when this verdict was given, even though they had been notified of the date and time of the contempt hearing, and the judge had rescheduled it from earlier in the day to avoid conflict with Mr. Gaddy’s doctor’s appointment. Their son, Kelly Gaddy – to whom they had given legal power of attorney – was present, but did not enter the courtroom because Judge Graham refused to give him permission to videotape the proceedings. To understand why a retired couple who have lived in Dunlap for over 20 years came to be threatened with jail, you have to go back even more than two years. 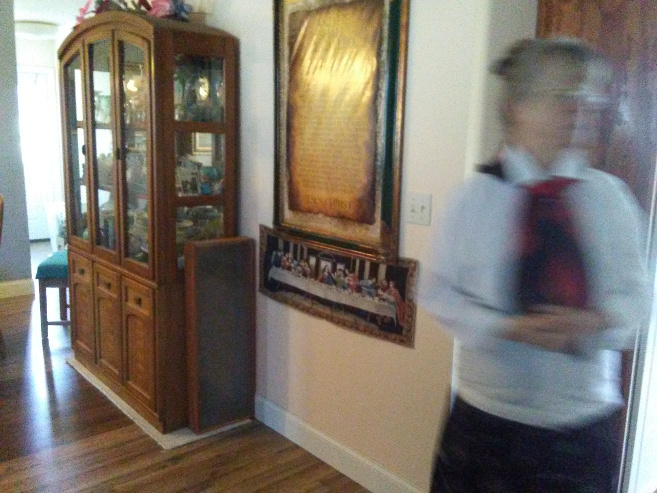 The inside of Thomas and Carol Gaddy's house. The Gaddys bought the house and moved into it in 1997. They say it was “pretty run down at the time.” They began to restore the house, but chose not to go in debt on it, preferring to work a little at a time, as finances permitted. 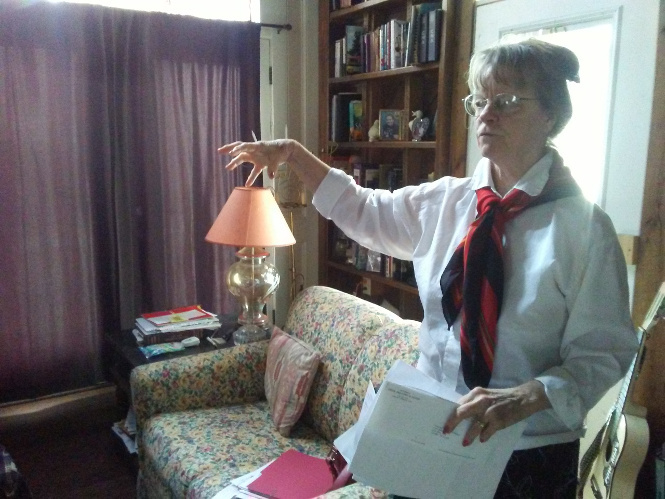 In May 2014, while the Gaddys were away, the city sent an inspector from another county to inspect the house. Dunlap Police Chief Clint Huth said he accompanied the man, who was not able to get very close to the house, since it is surrounded by a fence and the gate was locked. 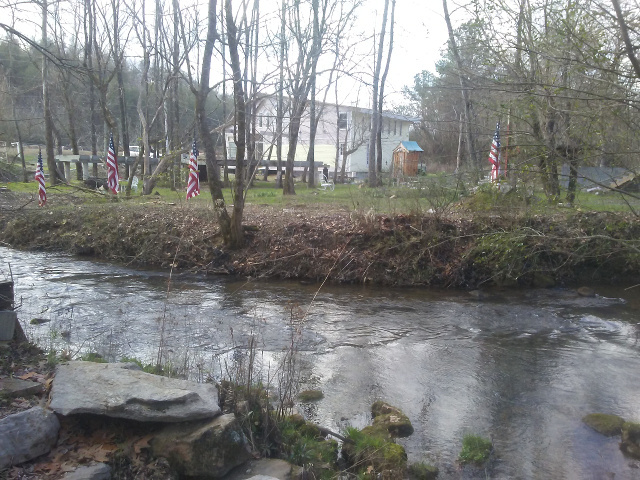 Some months later, Mayor Dwain Land was looking at the proposed route for a greenway trail along Coops Creek when he saw work going on at the 150-year-old house on the other side of the creek. After some discussion with City Codes Enforcement Officer Bill Dennis, they realized that the house was being remodeled, instead of torn down, as they had originally supposed. The house had been flooded in the past, even to the point of being half-destroyed by flood waters in 2003, but the Gaddys, who have experience in construction, proceeded to rebuild and remodel the house. Carol Gaddy describes the work she and her husband have done to slowly restore the historic 150-year-old house in the 20 years they have lived there. Mayor Land and a deputy went to the house on Main Street late one afternoon in January 2015. He informed the Gaddys that their house was not in compliance with city codes. A confrontation at the chain-link fence in front of the house ensued – Land called the visit a “courtesy call,” while Mrs. Gaddy said he told them they should tear their house down – and the mayor and the officer left. As a result of that complaint, a temporary restraining order was issued prohibiting any further work on the house until it could be inspected. On Feb. 24, 2015, the Gaddys spoke with Sequatchie County Property Assessor James Condra, informing him that they had conducted some repairs on their house and asking him to take a look at it. 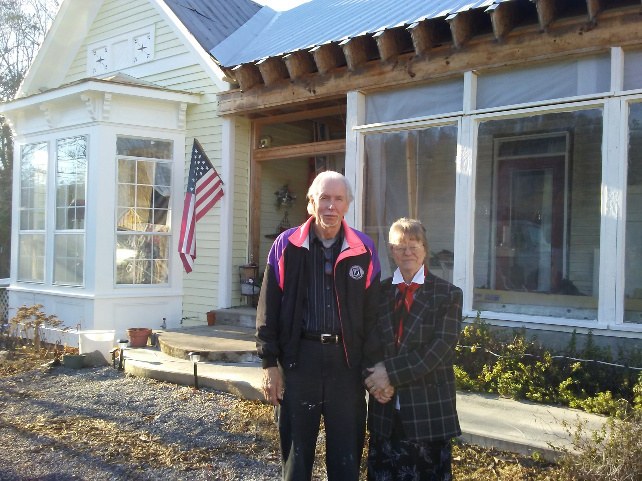 When Condra arrived, the couple showed him the concrete pillars they had constructed to raise the house up out of the flood plain of Coops Creek. They asked him if they had raised it high enough to remove any danger of flooding. In an interview with Dunlap News on Monday, March 6, Condra said, “I am not a flood plain administrator for the city; I am a flood plain administrator for the county. They asked me whether the house was in the flood plain or not. I said I would have to look at the flood plain maps to tell that. “From a general perspective, it looked like they had made an effort to raise it out of the flood plain. They had poured concrete pillars, 4 or 5 feet above the ground. I saw where they had attached the floor joists at the top of the pillars with metal clamps. “There was no question they made an effort. Those pillars were maybe 2 feet through. They were massive looking. I think they were reinforced concrete. The problem arises, however, when changes are made to a structure in a flood plain, or – even more consequential – in a “flood way.” A flood plain is where water from a creek or river pools up outside its banks in a flood. A flood way is where the creek actually runs freely, over ground that is outside its banks. The Gaddy house is in a flood way, Condra pointed out, looking at the FEMA flood maps on his computer. Because it is in a flood way, no significant construction can be done to the house without an engineering study being completed first, he said. In June 2012 the state of Tennessee began requiring all jurisdictions in the state to be part of the National Flood Insurance Program, Condra pointed out. As a consequence, anyone living in Tennessee has to comply with the requirements of that program, if they are in a flood plain or flood way. A permit is required for any construction in a flood plain, he said. Over the course of the past two years, Thomas and Carol Gaddy have represented themselves in court, filing counter-suits against the city of Dunlap and several individual members of the city government, as well as judges involved in the case. They say this is a “property rights issue” and have challenged the city’s case on several grounds, including jurisdiction and the accusation that the city did not follow due process in dealing with the Gaddys – “leaping over the lower remedies,” as Mrs. Gaddy said. Speaking to Dunlap News in February, Mayor Land said that the city inspector only needed to make sure the house was at a safe level above the flood way. He said that all the Gaddys have to do is get a Flood Elevation Certificate. The Gaddy home sits in an elbow of Coops Creek, which for many years was the southeast boundary of the city of Dunlap. A November court hearing before Judge Graham ended when Mrs. Gaddy was sentenced to two days in jail for contempt, after talking back to the judge. Dec. 8, 2016, the Gaddys presented three motions in Sequatchie County Circuit Court before Judge Graham, denying the city’s jurisdiction in the case because a 1972 annexation that included their house was never filed with the state, demanding that Judge Graham recuse himself, and requesting that future proceedings be held in the County Courthouse due to Mr. Gaddy’s health issues. Judge Graham denied all three motions and ordered the Gaddys to allow the city inspector access to their home at 1271 Main St. When Dunlap Codes Enforcement Officer Bill Dennis, City Attorney Steve Greer, Monteagle Building Inspector Earl Geary, Jr., and Dunlap Police Chief Clint Huth arrived at the Gaddy house Feb. 13 for an official inspection, no one was home. At the Gaddys’ contempt hearing last week, Inspector Dennis testified that he and the other men went to the home on Main Street to conduct an “internal inspection” of the house, but encountered a locked gate. Chief Huth testified that after the group of officials had waited for 10 or 15 minutes to be admitted to the house, they dispersed, but as he was leaving he saw a car parked on a side road across from the house. When he pulled alongside to see if they needed help, he realized it was Mr. and Mrs. Gaddy, and they had apparently been watching the gathering at the gate. Attorney Russell Anne Swafford, representing the city, pointed to this evidence in asking the judge to declare the Gaddys in “willful” contempt of the court, and Judge Graham agreed. He issued a writ of attachment which calls for immediate arrest and incarceration of Mr. and Mrs. Gaddy. As of Monday morning, March 6, sheriff’s deputies have made numerous visits to the house on Main Street to arrest the Gaddys, but have not found them yet.